Binga thinks she can be a model just like me. Let’s see how she does today. Here she is trying to look dramatic and wistful at the same time. This is her attempt at being adorable. I don’t know what she is trying to do here! So how do you think she did? Well, you KNOW we are Binga fans!! She looks adorable to us. We like 2 and 3 Binga looks thoughtful and amazing! 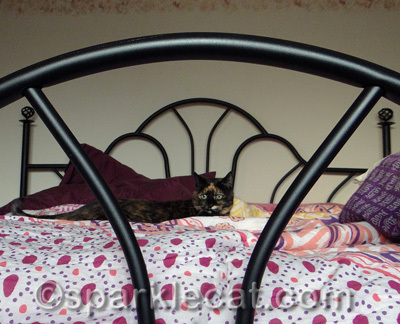 Binga is PURRFECT! Top model (after you of course) Sparkle! 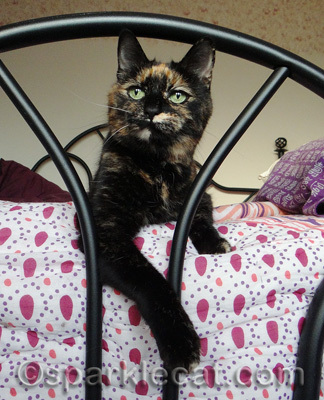 OK OK we are late to this…..
As a Tortie household it is more than our lives are worth to say anything other than BINGA ROCKS!! I don’t think mew can compare who is a better model- it’s like asking which cat breed is the best out of them all? We felines are ALL lovely in our colors, markings, sizes- that’s what makes us the superior species. 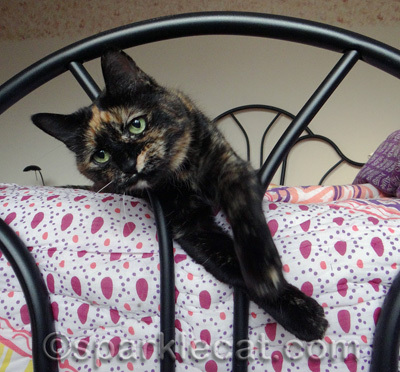 Binga mew look beautiful, cute, and are a supercatmodel just like mewz sisfur Sparkle. Sparkle has so much experience I’m sure she could show mew some moves and poses. No matter how many techniques a cat model may know, no cat can be of superior supercatmodel of caliber without the natural finesse and catitude (or tortitude for mew Binga) mew both possess- that’s what makes the Garza sisfurs unique and PAWESOME! 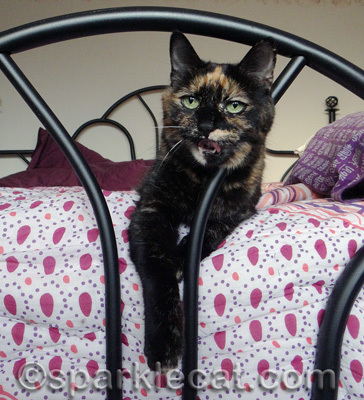 Binga is a very cute model, but you are sophisticated. Not bad! Although the last pic looks like she is planning what she is having for lunch! Well Sparkle, you are #1, but we do think that Binga did a fab job! Happy Halloween kitties! Did you get some good treats?